Not sure how to go about designing your e-learning course? In his book Principles of Instructional Design, Robert Gagne and his co-authors lay out a set of guidelines to ensure your learners acquire the knowledge and skills they need. 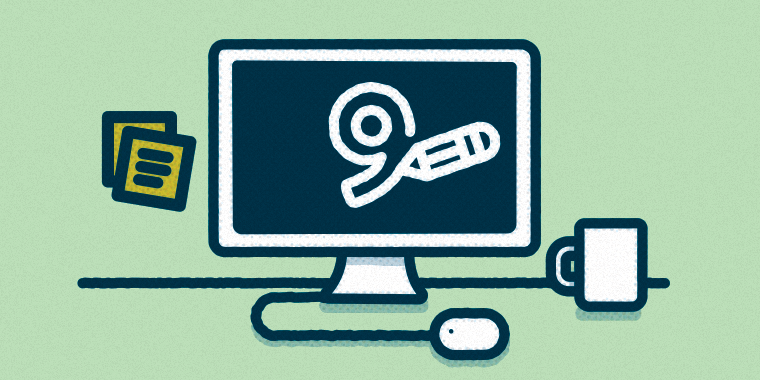 Let’s take a closer look at each of the 9 Events of Instruction and how you can incorporate them into your e-learning courses. Show a short, fast-paced video that introduces your topic. Ask a thought-provoking question about the subject matter. Tell a story that they can relate to. State a surprising fact to pique their interest. Combine upbeat sound effects with great graphics and timely animations to create an enticing intro. The key is to focus on what the learner is going to get out of the course, so they see what’s in it for them. Check out this article on how to define your learning objectives or this one on Bloom’s Learning Taxonomy for more help with this step. Asking open-ended questions about past experiences or concepts they have already learned to encourage reflection. Quizzing them on prior knowledge and then building on it. Presenting a scenario or a problem and asking them to resolve it. If they are unable to do so with their preexisting knowledge alone, present them with the new information they need. By building on what they already know instead of starting from scratch, learners are able to more easily retain new information or skills. Gamification. Turn your course into a game by incorporating challenges, rewards, and other gaming elements. Read this article to find out more about how to apply gamification techniques to e-learning. Interactive Video. Add interactivity to your video by placing hotspots at strategic moments, allowing learners to answer questions, get more information, or change the course of the video. Not sure how to do that? Check out this article to see an example and learn how to make your own interactive video. Storytelling. Incorporate the course content into a narrative that your learner can relate to. You can choose to make the learner a character in the story, or an outside observer. Read this article for tips on writing great e-learning scenarios. To keep your learners interested and engaged, it is important to vary the way you present content. Even gamified courses can become mundane if it’s all learners encounter. Building in hints to help learners with difficult concepts or questions. For example, you can place a question mark next to the concept or question that, when hovered over, displays more information to help them understand or answer the question. Providing examples to illustrate the content. Putting theoretical content into context will help learners to better understand and apply it. The best way to find out whether you’ve provided enough guidance in your course is to ask someone to test it and let you know if they find anything confusing or disorienting. Creating simulations. For example, in a software training course, the best way to let learners test their skills without leaving them completely out on their own is to create a simulation in “try mode.” That way you can still give them hints if they can’t figure out what to do next. Designing decision-making scenarios. By asking learners to apply course content to a situation or problem they may actually encounter in real life, you give them the opportunity to test their comprehension. The sooner learners apply their new knowledge, and the more realistic the scenario, the more likely they are to retain and apply it in real life. Build in branching that changes the course of the activity based on their answers. They will understand where they went wrong based on the consequences. Offer a second chance when they answer incorrectly. Give a hint and let them try again. Provide the correct answer so they’re not left guessing. Explain what they should have done and give them the correct answer. Depending on the subject matter, your target audience, and the way you’ve designed your course, you can determine which method is best. Now it’s time to see if your content helped your learners achieve the learning objective(s). The evaluation or assessment should resemble the practice section, but this time learners will not receive hints along the way. Make sure you don’t include any new information or skills in this section. You should only test learners on what they have already learned. Provide a printable job aid, such as a checklist or quick-reference document, that outlines the key concepts so learners can easily refer back to them. Give learners ways to practice their new knowledge or skill shortly after taking the course. Create a few short review courses or quizzes that they can complete during the weeks following the initial course to reinforce the knowledge or skill. If you have any questions or comments, feel free to share them below! And don’t forget to follow us on Twitter and come back to E-Learning Heroes regularly for more helpful advice on everything related to e-learning. Gagné, R. M., Briggs, L. J., & Wager, W. W. (1992). Principles of Instructional Design (4th ed.). Fort Worth, TX: Harcourt Brace Jovanovich College Publishers. Thanks for the post! All of this just simply makes sense. What would someone need to do if a client dictates to the IMI development and doesn't want to follow these obvious tips for success? You're welcome! I totally know where you're coming from -- it's not always easy to explain ID methods to clients. I guess you could always point them to this article! If that doesn't work, you could try creating 2 short example modules: one that follows these guidelines and one that doesn't, so they can see for themselves what a difference it makes. It may take some time to make these examples, but then you'd have them on hand whenever you sense that clients just aren't "getting it". Anyone else have any good tips? Thanks! I agree, as close to the real thing as possible is usually the best example. Those tips are in fact a process. And unfortunately, clients don't buy processes, they buy products... If you want to persuade a client, ask him if he wants his trainees to get hooked on from the very beginning (event 1), know exactly what they have to perform (event 2), and so on.... He'll probably say "yes I do" at each and every questions. You can then assure him that your course will produce everything you've just said. If he wants that product, you will follow a number of steps that sometimes need his inputs... That way, you're speaking the language of your client and never had to explain an ID process. This presentation can be repeated, adjust or simply posted on your web site as one of your core business values. I like the idea of presenting the 9 events to clients in a way that speaks to them. Great tip, Daniel! Daniel, This couldn't have come at a better time. I appreciate it! Great work and advice. Thanks for the effort. Once the client understands how it is going to benefit him/her the rest of the sell is easy. We have a challenging time when it comes to assessing learner performance! The customers are reluctant to the idea but I think if we used a different approach that is more like the ice breaker challenge or even something we offer after they've returned to their work life. Thanks so much for the awesome ideas. Nice work, Allison. I enjoyed this, especially your specific suggestions on how to apply each event.